The Practical Life exercises include activities that involve the child in purposeful work that give a sense of accomplishment and pride while developing motor skills, coordination and proper work habits. This area of the class encourages social development with specific focus on Grace and Courtesy lessons, where the child is introduced to etiquette and positive mannerisms. 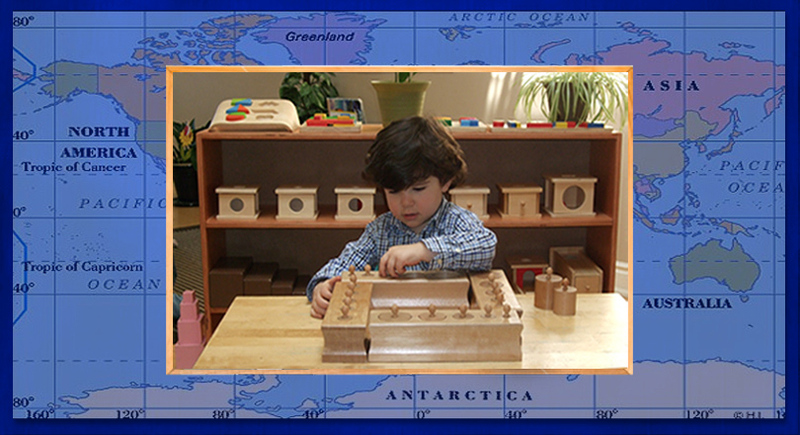 Materials included in this area of the Montessori environment are geared to further develop and refine the senses through classification and isolation of characteristics. This area familiarizes the child to various geometric shapes and language that is explored further in the Casa environment. Students are introduced to materials that encourage vocabulary enrichment to further solidify the fundamental ability to instill communication skills that commence in the verbal state and develop into written dialogue in the future. The Language curriculum includes pre-reading visual exemplars in the form of cards that help students understand other individuals, express personal thoughts and opinions as well as demonstrate growth in other curricular areas. The Math curriculum includes a variety of counting, number recognition as well as symbol and quantity matching exercises. Students progress to understand mathematical concepts using simple materials and eventually advancing towards more complex manipulative that expand their exploration of shape, size, symbol, and quantity. This area of study introduces the child to Geography, History, Botany, Zoology and Science lessons. Students are again involved with vocabulary enriching materials that also create an awareness and appreciation for the physical world and all that it encompasses. Students participate in various art projects that reflect classroom themes, cultural celebrations and festive holidays. They are exposed to different art media, design and techniques. The goal is to create an appreciation for self-expression and individuality. Students are exposed to rhythm, songs, dance and movement. They explore composers, different music styles and the families of musical instruments. Students explore the French language through participating in a variety of activities that include vocabulary lessons, songs and games. The physical education program encourages sportsmanship, cooperation, learning the rules of various games, specific sport skills and teamwork. Through creative exercises and play, students learn to develop their motor skills as well as a positive attitude when doing challenging tasks.